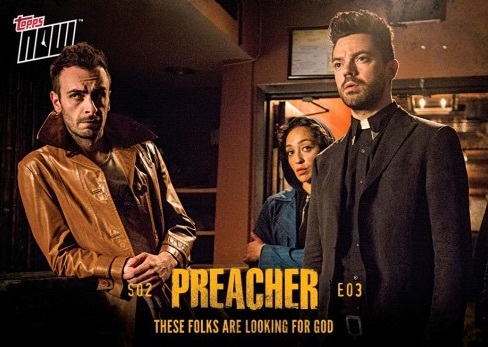 Showcasing the adventures of Jesse Custer and his friends, 2017 Topps Now Preacher Season 2 follows the well-established on-demand formula. 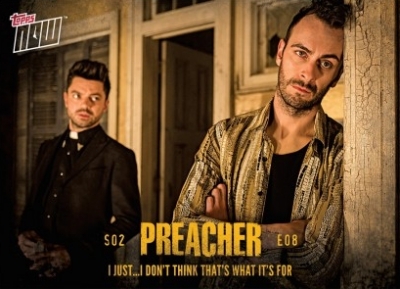 As with the first season of Preacher, the cards are done in conjunction with the most recently aired episode, and only available for 24 hours. 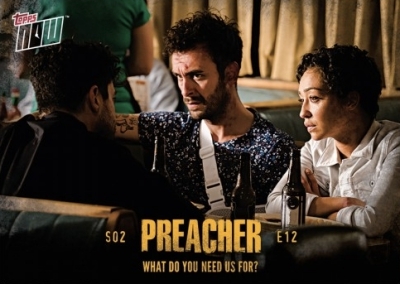 2017 Topps Now Preacher Season 2 is issued in mini-set form, with each release containing five episodic cards. 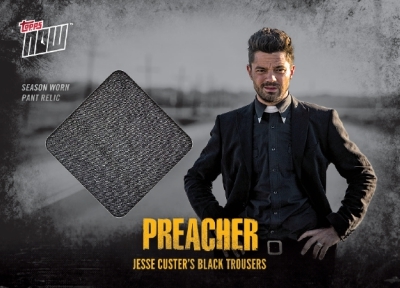 In addition to the base option, there is an opportunity for fans to own a piece of memorabilia from the acclaimed AMC series as season-worn costume relic cards are available as well. Topps even revealed a gallery of the still-intact items planned for usage on their blog. While there is no pre-set production run for the base offerings, collectors have just a short 24-hour window to purchase the cards. After the selling period closes, final print runs are revealed on the Topps site. 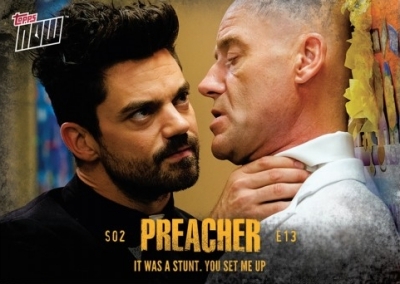 The 2017 Topps Now Preacher Season 2 pricing is $19.99 for each five-card set, while the three-set bundles sell for $49.99. Costume relics start at $49.99 for the base (#/25), $74.99 for the Red (#/10), and $199.99 for the one-of-one Gold. The cost of shipping is free across the board, that is, if the Smart Post option is selected during checkout. 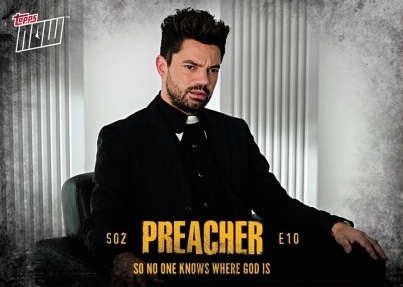 Be sure to check back as the 2017 Topps Now Preacher Season 2 guide will be regularly updated with new cards and details. 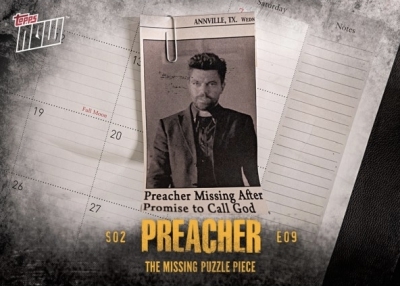 The specific episode is noted along with the date the set was released. Every five-card set is sold for 24 hours. 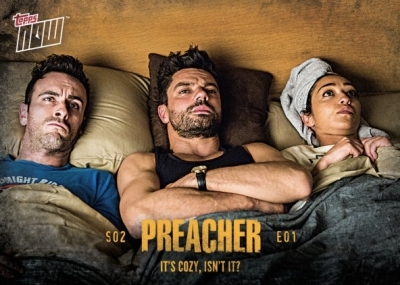 Set print runs (PR) will be added when known for each episode. *Relic Parallels: Base #/25, Red #/10, Gold 1/1. 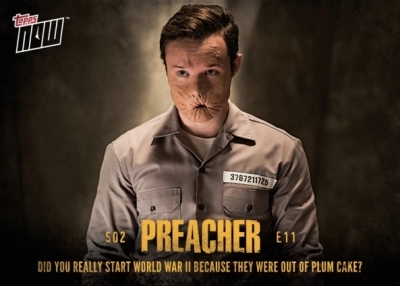 Shop for available Now Preacher cards on Topps. 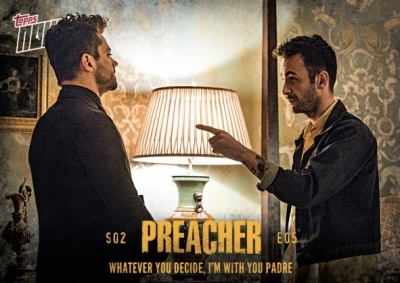 Click on the episode listings below to shop for cards on eBay. 5 It’s Cozy, Isn’t It? 6 Where Will You Go Next? 22 You Were Hurt? What Are These Then? 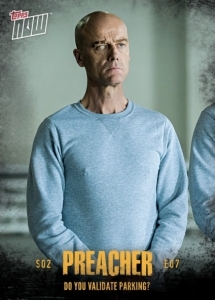 23 You Found Him? You Found Carlos? 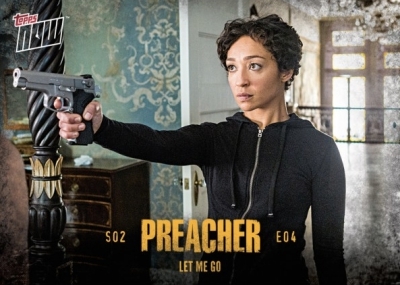 Does Jesse Know? 35 Do You Validate Parking? 40 Don’t You Worry, A MHAC. 47 What’s Up? You Alright? 48 Who Is The Boy? 52 Did You Really Start World War II Because They Were Out Of Plum Cake? 56 What Do You Need Us For? 59 So Shall I ask You To Beg, Or Should I Make You? 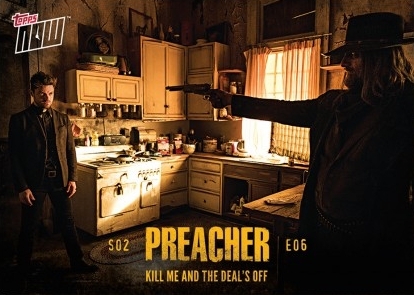 62 Everything Has A Price. You Understand? 63 I Never Did Tell You About Dallas, Did I? 66 Okay, Kids, Who Wants To See A Miracle?